59% pure vegan Protein. Popular with athletes, bodybuilders and anyone looking for that extra protein boost. It's also high in many vitamins and minerals, and mixes well in smoothies, shakes, porridge and even pancakes! Protein contributes to the growth and maintenance of muscle mass. 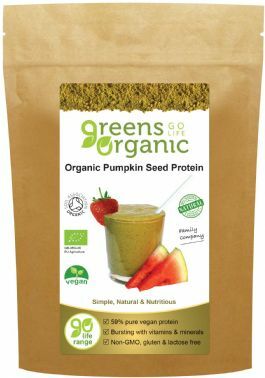 Soil Association Certified Ingredients: Greens Organic Organic Pumpkin Seed Protein powder is made from ground, cold-pressed organic pumpkin seeds, and that's all, nothing else is added!